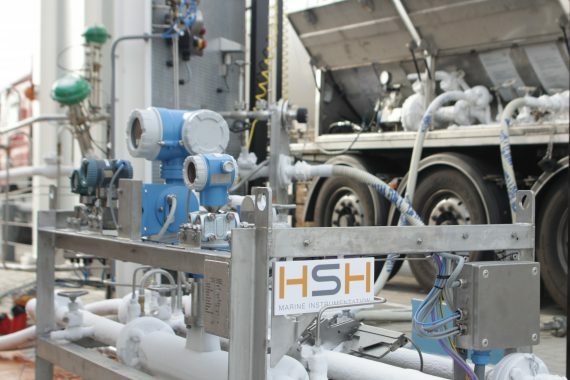 In order to realize a dedicated transfer measurement system for ship-to-ship LNG bunkering and small scale LNG transfer Henri Systems Holland B.V gained practical experiences with the design, testing and operating of mobile in-flow verification and calibration facilities. With decades of experience in supplying level measurement and alarms systems for LNG and LPG carriers including inland barges, Henri Systems Holland was in a perfect position to compare the feasibility and employability of both dynamic and static measurement in practice in this new segment. The research was supported by TNO, the Netherlands Organization of Applied Scientific Research and different suppliers of flow measurement instruments cooperated in the project. The emerging interest of LNG bunkering and small scale LNG trade is pushing the demand for both multi-gas carriers and inland barges being deployed for LNG bunkering and small scale LNG transfer. This market development brings different principles, standards and guidelines in the field of transfer measurement technology together. The lack of practical feasible standard for this new market segment together with the diversity of potential technical solutions was the motivation of the presented research. In the traditional situation the LNG industry segment is strongly educated with a guideline for Custody Transfer Measurement Systems.In the traditional LPG shipping segment, where LNG has been introduced on multi-gas carriers, the practicality of dealing with a large variety of liquid gases is dominating the choice for technology. In contradiction with both marine segments, which rely on ‘static’ level measurement as generally accepted measurement principle, in the land based industry including emerging on-shore LNG retail segment, in-line ‘dynamic’ mass flow measurement is the standard practice that is supported with legal frameworks (e.g. MID in EU). The objective of the research is to evaluate different measurement technologies for its applicability for marine small scale LNG transfer and bunkering. In this research aspects, such as accuracy, robustness, reliability, maintainability and the feasibility of on-board verification (for class approval), have been evaluated in practice and experimental setups. The presented research resulted in a design of a cost effective measurement system that is being proven in practice. 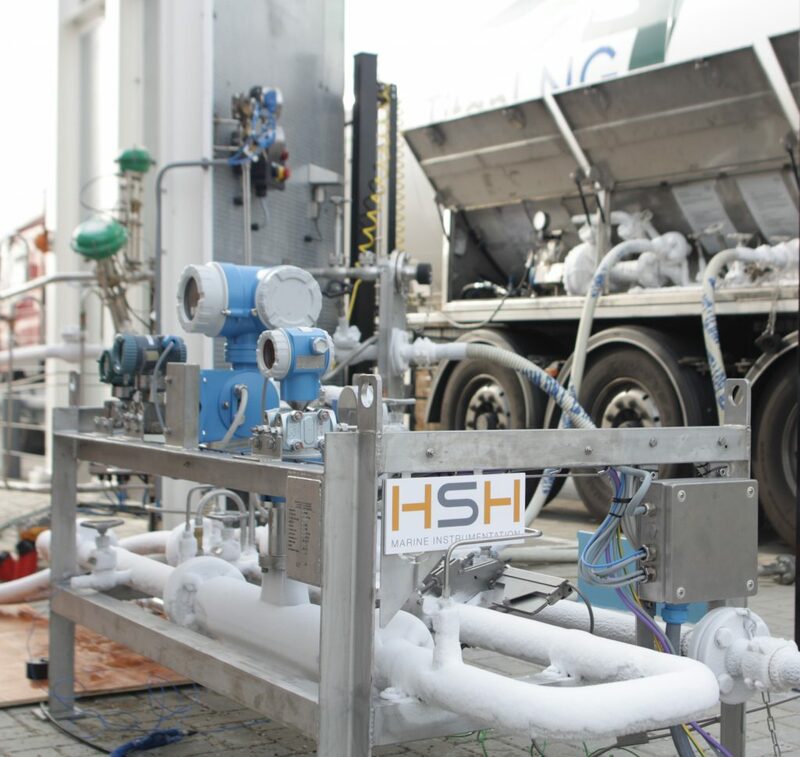 In the research an in-line (mass) flow measurement experimental setup (flow-skid) was constructed and applied for measuring LNG transfer between a LNG bulk truck trailer and the LNG storage tank of a LNG fueling stations at a location in the Netherlands. As the test were being performed at this existing on-shore facility we had the opportunity to perform a vast amount of tests in real practice. From the results we have been able to compare the uncertainties from both ‘static’ and ‘dynamic’ measurement at different sized transfer badges. One of the conclusions of the research was that at partial transfer of the marine cargo, in-line mass flow measurement (with a proven maximum error of 1.5% of full scale) can result in a smaller measurement uncertainty than what is being achieved with ‘static’ measurement (CTMS) from which the accepted accuracy is smaller than 0.3% of the total cargo transfer. The calculated tipping point of accuracy between static and dynamic measurement helped us to optimize the scope and design of an measurement system for specific application on board of multi-gas carriers and LNG bunker vessels, and barges. Please contact HSH for more information on: Custody Transfer Measurement Solutions for small scale LNG and LPG (Bunker)vessels;Verification of in-line LNG transfer measurement systems (LNG dispensers, (mass) flow meters).